While preparing my Hussite army for use with To the Strongest, I realized that, among other things, I needed some figures to act as "expendable heroes" under the rules. These essentially give the init they are attached to a one-time re-play of a failed Melee "To Hit" card. For "Deep" units liike War Wagons that can take three hits, this can be especially useful. Having no spare Hussite figures, and not yet having made the decision to add some Kingmaker figures, I remembered that I had quite a few unused "character" figures form the colorful Old Glory :"Revolting Peasants" set. For an army that was mostly made up of just that, they seemed like they might make suitable and also interesting "Heroes". Here we have "Bob the Cleaver". He's a beefy butcher turned hero. making good use of his buns! This is Adam the Philanderer. or at least their hearts! even if not all are quite so willing! Jeff is more of a stand up kind of Hero. He leads his men in a more practical fashion. and always happy to give you the shaft! This is Tom the torchbearer..
but he's always ready for action! as he cries "Burn, baby, burn!" Last we have Costello the Abbott. although he has been known to ham it up at times. Although a man of the cloth, he backs up his words with a sword. "For what we are about to receive, make us truly thankful!" Group 1, Tom, Matt, and Bob. I used a very dark "magic wash" which gives them a suitable somewhat grubby look. Group 2: Jeff, Adam, and Costello are always ready to sacrifice for The Cause when needed! Bad, bad Badeners.. but Murawaski and Rawkins are perfect together! My previous post on the Grand Duchy of Baden from 2011 has been one of the most viewed of all time for this blog. As I observed then, it can be difficult to get good information about this minor state Napoleonic army. Aside from the brief existence of the Pontoonier miniatures Baden figures that I was lucky enough to obtain circa 2008 (and depicted in that same post), specific 25/28mm figures for Baden had also been sorely lacking. Franznap in Germany has released some really exquisite figures for Baden in the past 1-2 years, with more planned. However, those are 1/72nd (20mm), and thus not suitable for my purposes. There are some Badeners available i9n 15mm scale, but once again, that doesn't help me. Late last year, Muarawski Miniatures, makers of an extensive and very well researched and sculpted line of 28mm figures for the (Grand) Duchy of Warsaw, finally began to fill some of that gap. They had a nice pre-Christmas sale, and I took advantage of that to pick up enough figures for 2 more units of Baden infantry. With the two units of Pontoonier Baden line and the one unit of Pontoonier Baden Jagers, this would allow me to depict the entire infantry arm of the Grand Duchy, aside from the small battalion of the Leib Grenadier Garde, which saw no real fighting during the Napoleonic Wars. Lead now in hand, I was quite excited to paint these troops, so they moved to the top of the queue. I have yet to see any painted examples of these fine fellows yet, so while I'm sure a really pro painter could do them better, I am happy to share my work with all of you. The names and lineage of the four Baden infantry regiments gets a bit tricky (we'll come to more on that later), but in 1809 this is Infantry Regiment #2, "Erbgrossherzog". Yellow facings, yellow metal buttons and fixtures on the helmet. I'll also come to a discussion of the flags later, but suffice it to say that most of the sources indicate this unit should have flags with RED as their distinctive color instead of the Yellow shown here. I have deliberately chosen top ignore that. The Grenadier companies have white plumes and red epaulets, the Schutzen (light/sharpshooter) companies have green plumes and epaulets both. The Baden army increased its regiments from one field battalion to two and were adopting French six company battalion organization as the "Crisis ion the Danube" broke in April of 1809. The second unit I painted as I. R. #3, "Von Harrant". White metal buttons and fittings on the helmets for this regiment. Some (most) sources give their facings as "red" or "scarlet", same as I. R. #1 but others say "Deep Red". I chose to go with a darker shade of red (Delta CC "Moroccan Red") to make them stand out more from my previously painted (Pontoonier figures) I.R. #1, "Grossherzog", for which I used a bright red shaded towards the orange range. Once again, I chose to give this unit flags with a (deep) red distinctive color, where sources indicate the flags should have dark blue instead. The red turnbacks are common to all regiments, and are painted in an intermediate shade of red (Delta CC "Fire Red"). I painted all the facings and turnbacks white first, then over painted them with the facing/turnback color to make the colors deep and vivid. For some reason, I have great difficulty accessing his site from any links or searches. Anyway, when I was able to connect, I downloaded the E-book on Baden - for about $6 US, you get 132 pages chock full of background information, organization, uniform and flag details, accompanied by a great many color illustrations, many of which I'd never seen before elsewhere. As I've observed before, there is no Osprey on this interesting army, and Knotel has no plates of the 1809 Line infantry uniform. Even his text in "Handbuch der Uniformkunde" glosses over the Line infantry without listing their facings ( was hoping to see how they appeared written in the original German) , and stating that they were all red in 1809, which is off by a year or two. Funken also doesn't illustrate the 1809 uniform, and the Histofig site, which was one of the sources that I used for my blog post in 2011 is now defunct. In short, if you want to paint Badenetrs.... BUY THIS BOOK! 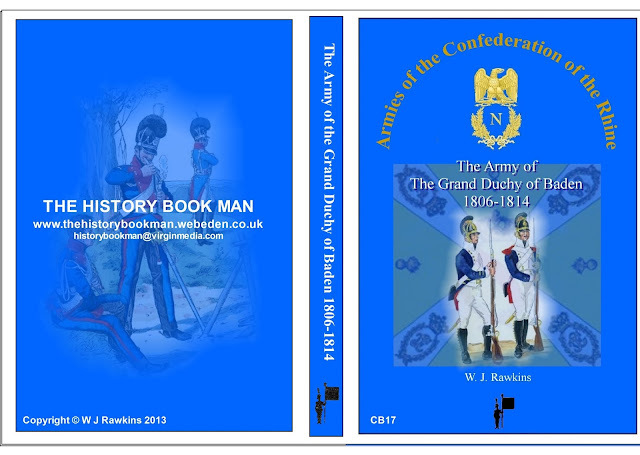 Rawkins has a great many other Napoleonic titles, including the (Grand) Duchy of Warsaw, Sweden, Wurttemburg, and many others, with more new titles planned. #The army of 1809 was assembled rather hastily, with the Regiments being enlarged absorbing men from the Garrison regiments as well as the introduction of conscription. To make things more confusing, one regiment was sent to Spain, but was composed of 2 battalions, each from a different parent regiment (#'s 3 and 4) and thus each with a different facing color but nominally (? re-) numbered as #4. Note that the 1st regiment is again differentiated from the rest, in this case nopw by having red cuff flaps instead of the blue ones otherwise worn by Baden infantry. It is odd that the 1st regiment retains some distinctive features still, but now it is the Yellow faced 2nd regiment that has the Grossherzog (Grand Duke) as it's inhaber. I suspect this is because it was formerly the regiment of the Crown Prince (Erbgrossherzog)Karl, who became the new Grand Duke (Grossherzog) upon the death of his Grandfather, Karl Friedrich, in June 1811. Interestingly, Karl was married at age 20, in 1806 and very much against his wishes, to Stéphanie de Beauharnais, a cousin of Josephine's first husband, Alexandre François Marie, Viscount of Beauharnais. Lacking heirs, Napoleon had adopted her and named her an Imperial Princess, using the dynastic marriage to cement an alliance with Baden. By all accounts it was an unhappy marriage, with Karl avoiding his wife as much as he could. He had to pretty much ordered to start producing heirs; their first child was not born until 1811, and no males survived past infancy, which would cause problems with the succession in 1818, when Karl himself died at the young age of 32. Here are some more pictures of the Murawski Badenes, also taken outside but early on a cloudy morning, and with a different background. The earlier pictures were taken at mid day on a very cloudy day, thus requiring no flash, and overall I think the mid day ones came out better. The flag was printed out from warflag, and enhanced with some paint to the colored Maltese cross sections. The none criticism I would have of these figures, is that their raupenhelm lacks a "comb". While different illustration of the Baden raupenhelm show the comb to be varying heights from low to medium, it was distinctive in that it was colored with red and yellow enamel (the Grand Ducal colors). After some experimentation, I painted a yellow stripe at the base of the black"caterpillar"(or "sausage roll") crest, and then added red upright stripes. Overall, this seems to have worked better than I expected, and I think the results are quite presentable. The lace on the red wings and sleeves of the drummer's uniform was white with 2 yellow and one red stripe - I have just used the yellow and red to suggest this decoration. the drum rim are red and yellow. Some illustrations show red flames and/or the Ducal arms (as seen in the center of the flags) painted on the body of the drum, others just plain brass. The officers retained the Bicorne until the shako was adopted; they never wore the Raupenhelm. Baden officers wore a sash of silver, gold, and red. The raupenhelm had a small cockade of red within yellow on the left hand side. as seen here, the narrow lapels extend all the way up to the collar. Shoulder straps were generally dark blue, later piped with the facing color. Finally, here are some overview pictures of my entire 1809 Baden force - 4 Line, 1 light, and a few command figures - some 93 in all. I hope to add an artillery battery or two (there were 1 horse and 2 foot batteries) and the Baden light Dragoons in their distinctive medium blue uniforms at some point... still waiting for someone to make them! From Left to right, IR #1 "Grossherzog" (Pontoonier), IR #2 "Erbgrosherzog" (Murawski), IR #3 "von Harrant" (Murawski), IR #4 " von Porbeck" (Pontoonier). Each of the 4 regiments received two flags, a Leibfahne which was given to the 1st Battalion and a Regimenterfahne which was carried by the 2nd Battalion. The flags were of a common design and differed only by the colour for each regiment. The Regimenterfahne was white with a Maltese cross of regimental colour. This did not necessarily equate to the regimental facing colours as the original flags were retain by their battalions when the regiments moved in the line seniority. The Leibfahne were the reverse, with the flag of the regimental colour and the Maltese cross white. The exception being the Linien-Infanterie Regiment Nr 1 ‘Grossherzog’ (Formerly the Leibregiment) who carried a single pattern of flag presented to both battalions of scarlet with a yellow Maltese cross. From 1808 to 1814 the regimental colours for the flags were, 1st Regiment – Scarlet; 2nd Regiment – Scarlet; 3rd Regiment – Dark Blue, and 4th Regiment - Yellow. Keith Over says pretty much the same thing, as does Terrence Wise (Osprey Men at Arms #77). The flag staffs were painted brown. Thus you can see that aside from the 1st regiment's red/yellow flag, I have intentionally mis-assigned the Regimenterfahnen colors so that the distinctive color of the flag matches the facing color of the regiment (in the case of #4 with white facings, Dark blue is substituted for white). It seems pretty obvious that this was likely what was originally intended before the shuffling of the regiments. Rawkins' book has a marvelous plate by Hourtelle showing just about the scene I have created above, with the yellow flags carried by troops with yellow facings, red flags by troops with red facings, and the dark blue flag carried by men with white facings. It just looks so much better and is so much more rational. Much more fitting for the troops of a ruler said to epitomize the ideals of the Age of Reason! A few final shots of the entire Baden 1809 collection again. Rawkins' book, by the way also includes descriptions and color illustrations of the flags of the Liebgrenadier Garde, Garde du Corps, Hussars, and Light Dragoons as well. Like I said - BUY THIS BOOK! Color Party on parade in Karlsruhe! The officers seen here at the rear are Pontoonier figures. Hussite Wars Part 4:War Wagons!